UPDATE: If you, a family member, an employee, or an employer, are a Washington state resident, and have been affected by this Executive Order, please contact the Attorney General’s Civil Rights Unit at 206-442-4492. SEATTLE — Attorney General Bob Ferguson announced that he is filing a lawsuit in federal court today against President Donald Trump, the U.S. Department of Homeland Security and high-ranking Trump Administration officials. Ferguson’s complaint asks the United States District Court for the Western District of Washington to declare unconstitutional key provisions of President Donald Trump’s immigration Executive Order. Attorney General Bob Ferguson announces lawsuit challenging Trump executive orders on immigration at a Jan. 30, 2017 press conference. 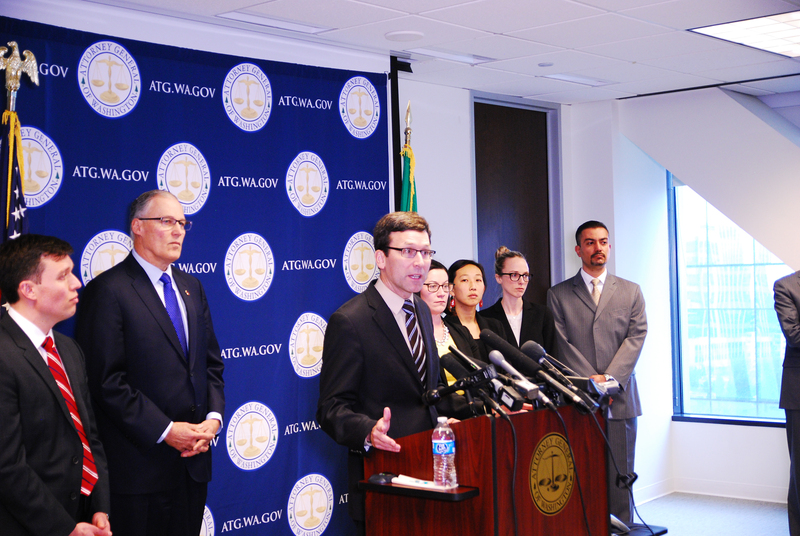 From left: Solicitor General Noah Purcell, Governor Jay Inslee, Attorney General Bob Ferguson, Wing Luke Civil Rights Unit Chief Colleen Melody, Assistant Attorney General Marsha Chien, Solicitor General's Office Fellow Kelly Paradis, Assistant Attorney General Patricio Marquez. The Attorney General also filed a Motion for Temporary Restraining Order seeking an immediate halt to the Executive Order’s implementation. Ferguson argues that the Executive Order violates the U.S. Constitution’s guarantee of Equal Protection and the First Amendment’s Establishment Clause, infringes individuals’ constitutional right to Due Process and contravenes the federal Immigration and Nationality Act. Major Washington state institutions supported the Attorney General’s lawsuit through declarations filed alongside the complaint. In their declarations, Amazon and Expedia set forth the detrimental ways the Executive Order impacts their operations and their employees. On Saturday, a federal judge in Brooklyn issued an order enjoining the Trump Administration from enforcing its Executive Order as to certain individuals who have arrived in the United States. Ferguson’s lawsuit is broader in scope and seeks to invalidate entire sections of the Executive Order nationwide. Today’s complaint asks the court to declare major sections of the Executive Order illegal and unconstitutional and to enjoin the Trump Administration from enforcing the policy. The Attorney General also asks to court to schedule a hearing within 14 days. Solicitor General Noah Purcell; Deputy Solicitor General Anne Egeler; Assistant Attorneys General from the AGO’s Wing Luke Civil Rights Unit including Unit Chief Colleen Melody, Patricio Marquez and Marsha Chien; and Solicitor General’s Office Fellow Kelly Paradis are handling the state’s case. The Attorney General’s Office would also like to acknowledge the outpouring of support from the public and the legal community, with special thanks to the American Civil Liberties Union of Washington, the Northwest Immigrant Rights Project and the National Immigration Law Center for their extensive work on these issues.